I have an old friend that I met back in the days when Usenet was big. We both hung out at a fashion group (alt.fashion) and I was so excited when suddenly, a few weeks ago, she e-mailed me. Anya is a natural perfumer, and she told me that she had developed a line of essential oils for food, rather than for fragrance. She asked if I wanted to try them - and of course I did! I don't know much about essential oils or absolutes, so I asked Anya how they're made. She replied: "Essential oils are made by steam- or hydrodiffusion of plant materials, in a process called distillation. The "oils" aren't necessarily oils as we think of them, meaning the fixed oils. They're often much more ethereal than that, and many are lighter than water, and will float on water. However, water can also be used to disperse them, especially when the tiny amount you'll be using is placed in water. You can experiment with seltzer water, some simple syrup and ice." Cool. Her range is very comprehensive, and includes holy basil, lavender, lime peel, vanilla absolute, saffron, mushroom absolute and many others. 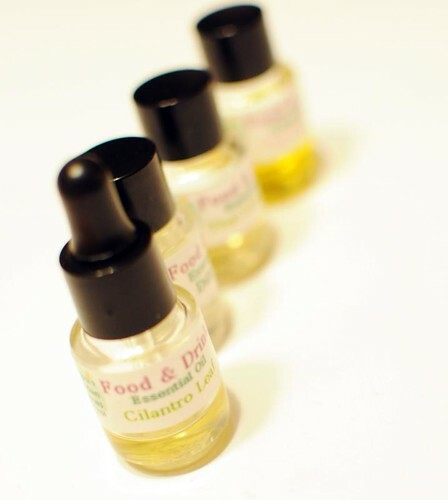 I was sent four oils, but have only tried the cilantro leaf yet. I'm a cilantro addict, more or less - ever since I discovered this awesome herb, I want to eat it all the time. (And that was hard, because I fell in love with it while I was an exchange student in the US, and at that time, cilantro wasn't really sold in Sweden at all!) My store usually has fresh cilantro, but it's often pretty sad and the plants are tiny. I could definitely see the point of an essential oil, easy to add, drop by drop. And a drop is all you need, seriously. I added a drop - a big drop - to a small bowl of store-bought salsa, and ended up having to add much more salsa in order to get a milder flavor for the over-cilantro-ized salsa. I meant to try many more things, but honestly, haven't had the time. As soon as I'm back home, I'll try a simple cilantro yogurt to stir into a soup, I bet that will be great. As for the other oils I received, I got pink grapefruit that I'm planning to bake macarons with, and thai lime leaf that I think will work wonderful for soup. And dill weed, which honestly, I'm a bit hesitant about - dill is not a favorite of mine, which is too bad since it's rather common in Sweden. Other bloggers are writing about this too! Check out The Windesphere Witch, Perfume Shrine, Ca Fleur Bon, Better Baking and Bois de Jasmin. And Anya's own page, of course. The pink grapefruit macarons sound awesome! Can't wait until you post that recipe! You've tried growing cilantro, right? Easy as can be. You won't necessarily get huge plants, and the strength of the flavor may vary, but you'll always have the freshest cilantro at your fingertips. It's an annual with a short life cycle, so successive plantings will ensure a steady supply. I absolutely love this idea and can't wait to try some. I visited Anya's site but can't seem to locate the food EOs. Where can I purchase some? Anne, thanks so much for being a test chef for the oils. You see how concentrated they are, yes? Pink grapefruit anything, especially macaroons or pastries sounds wonderful. I'm a terrible baker, so I'm excited to see what you make. I like to buy a can of dulce de leche - is that available in Sweden ? - and think it a bit with milk and then perfume it with something floral, like ylang ylang - or pink grapefruit. Then i drizzle it over a crepe or ice cream. Alissa, the link Anne provided in the article works well. Do you want to try again? Thanks Anya! I completely overlooked that section. I made truffles once with ylang ylang, and I rolled them in finely shredded dried coconut. Tropical temptations.